Facebook founder Mark Zuckerberg commended Jobberman founders Olalekan Elude, Ayodeji Adewunmi and Opeyemi Awoyemi in his statement ushering the launch of Internet.org in Nigeria. Internet.org is a partnership between social networking services company Facebook and six companies (Samsung, Ericsson, MediaTek, Opera Software, Nokia and Qualcomm) that plans to bring affordable access to selected Internet services to less developed countries by increasing efficiency, and facilitating the development of new business models around the provision of Internet access. The app delivering these services is named Free Basics. Free Basics and Internet.org has been controversial in several countries such as India, however, many still argue that the benefits outweigh the net neutrality issues. 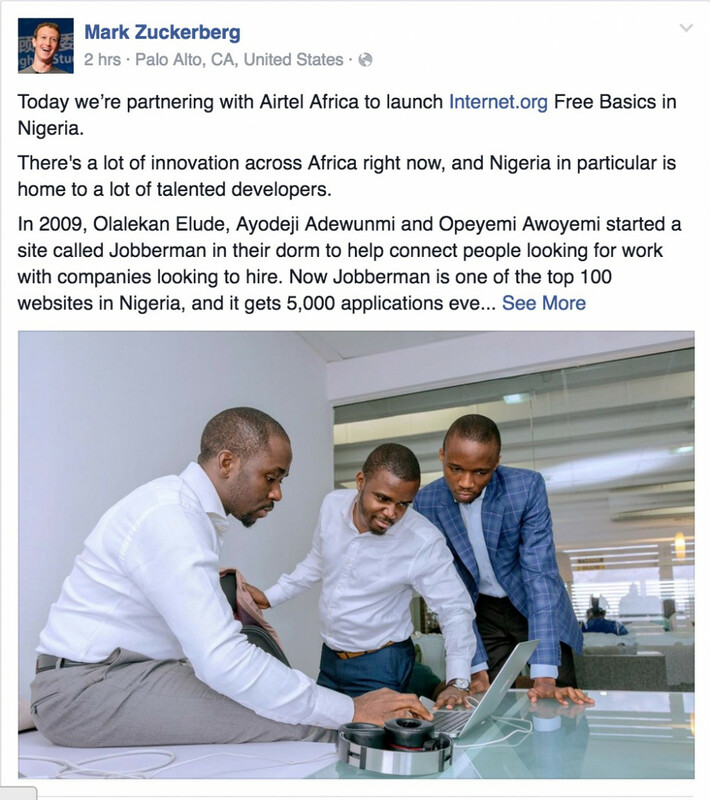 Today we’re partnering with Airtel Africa to launch Internet.org Free Basics in Nigeria. There’s a lot of innovation across Africa right now, and Nigeria in particular is home to a lot of talented developers. In 2009, Olalekan Elude, Ayodeji Adewunmi and Opeyemi Awoyemi started a site called Jobberman in their dorm to help connect people looking for work with companies looking to hire. Now Jobberman is one of the top 100 websites in Nigeria, and it gets 5,000 applications every day. Free Basics offers Nigerians, including 90 million people who are currently offline, the opportunity to access news, health information and services like Jobberman that were built by Nigerians and other developers across West Africa — all without having to pay for data. Free Basics is now live in more than 40 countries, and half of those are in Africa. Over the next few months, we’ll be doing even more to connect developers with people who can use their apps — and partner with local companies to bring internet to people across Africa who don’t have access to mobile networks. In the meantime, I’m excited to see what Nigerians build next!